This gallery shares gorgeous purple bedroom ideas in a variety of layouts and design styles. Purple bedrooms can really make a statement and transform a room in to a lovely escape you’ll love. Whether you’re looking for traditional elegance, modern, contemporary or inspiration for a teen or child’s bedroom you’ll find plenty of options below. 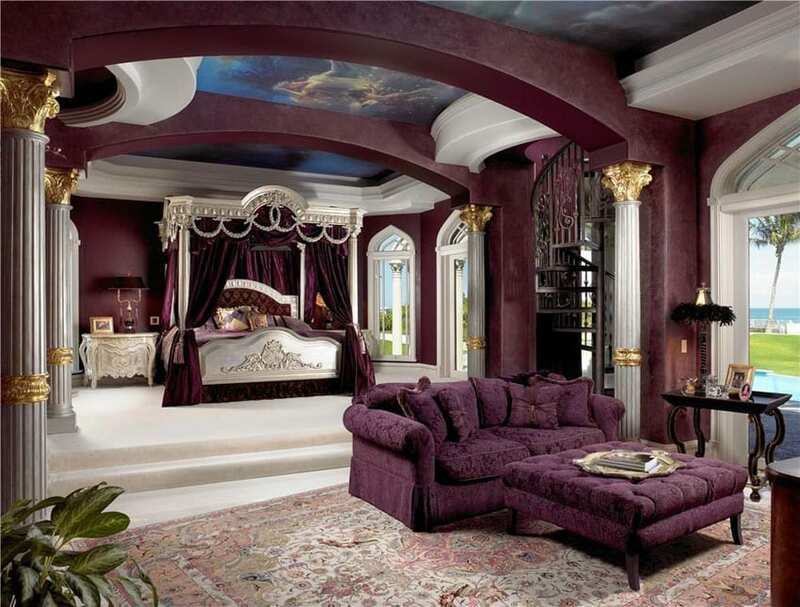 The Rococo style furniture and decoration in the image above gives this all-purple room a soft, feminine appeal. The room evokes a very luxurious feel as well, as it uses heavy fabrics and gilded furniture. Satin and velvet were used in the space, and even combined with white lace, for that very feminine vibe. For this bedroom, it uses mainly Lavender and some hue variations, in combination with creams to help create a more balanced look. The color purple is often associated with royalty, power and wealth. Back in the day, purple dye was both hard to acquire and hard to produce, making purple-dyed items very expensive. Because of this limitation, only the upper-class and the royal family are able to afford such. During the Elizabethan Era, the Sumptuary Laws forbade non close relatives of the royal family to use the purple color, making it even more exclusive. Nowadays, purple dye and purple-colored materials are more easily acquired, and does not have the same hefty price tag. You are now able to use the “color of the royals” without breaking the bank. Some people are a bit intimidated in using purple, but with the right combinations and by using the right hues, you’ll be able to achieve a very elegant look to any space. Purple is created using the two primary colors of blue and red combined. Using different pigment shades can get drastically different color outcomes. These wide variety of shades all fall under the category known as purple. When matching purple its important to determine at which range of the color your shade is located. You will want to discover if your purple has more red or blue tones or rather if it is a true purple with equal parts. Once you have determined your purple colors undertones you can find the colors that best compliment it. For instance, a reddish purple shade can match well with its red base color. The same goes for purple shades matching its blue base color. Most purples will generally match well with black or gray. While shades of purple such as lilac or lavender can match with paler forms of blue. Additionally, fuchsia shades can pair with pink. With the variety of hues and shades of purple available, the right mix will be able to create your dream purple bedroom. Below are some examples of purple bedroom ideas for your reference. This contemporary bedroom space looks very elegant and luxurious despite the simplicity of the furniture forms used in the space. A combination of furniture styles can be seen in the room, as well as a variety of wood finishes. While the furniture pieces uses neutral-colored fabrics like beige, taupe, cream and white, the mauve-painted wall adds a very subtle accent, making the space look more lively without over-powering the rest of the elements in the space. 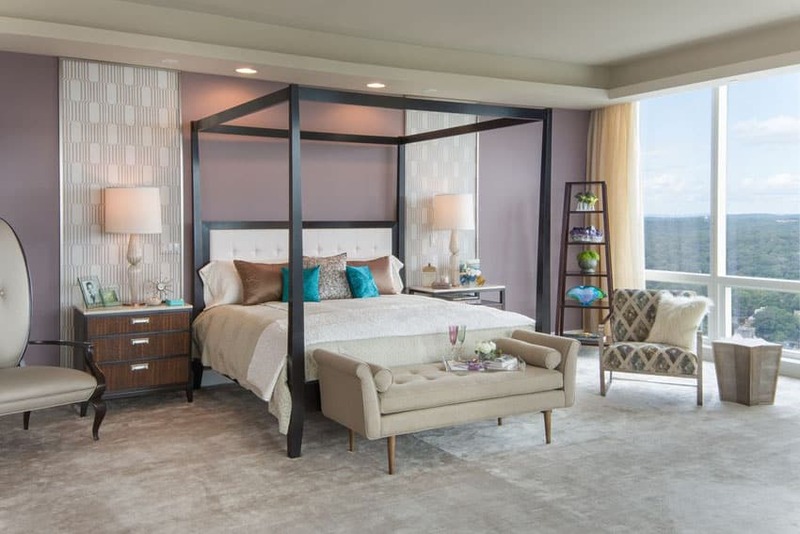 A contemporary bedroom with a combination of furniture styles, this bedroom uses 3 varieties of purple. For the walls, it uses a more neutral Lilac color for a soft and light background color. The bedsheets are a little bit darker, using lavender Egyptian cotton, while the accent chairs adds a bold pop of color with its grape-colored velvet upholstery. This contemporary bedroom design uses all-white furniture pieces in the space to help tone down the vibrant purple colors used in the space. Walls uses a bright Grape color, while the sheer curtains and the area rug uses a more red-toned mulberry color, creating a good balance and variety in the space. Similar to the previous example, this bedroom also uses all white furniture which helps balance-out the grape-colored accent wall. In addition, the bedroom also uses beige carpet flooring and gray general wall, contrasting with the very vibrant accent color. This bedroom boldly mixes different furniture styles, colors and finishes, creating a fantasy-like eclectic bedroom design. You see the bold mixture of cherry wood floors with the grape-colored walls, dark green wrought iron bed and side table, and a gold bench with leopard print upholstery. The plain white bed sheets, window frames and moldings help tone down the bold wall color and soften the over-all look of the space. A fun, youthful vibe is definitely felt in this bedroom design as it boldly mixes different colors, patterns and textures. Instead of a basic plain puple wall color, this bedroom uses 4 different hues on its walls, creating a color palette-like wall which goes lighter as it reaches the ceiling. Since the wall color is already bold, furniture pieces, as well as moldings and curtains are simply in white, which also help balance out the colorful geometric patterns found on the bed sheets which combines teal and purple. This simple yet elegant twin bedroom combines classic furniture and accessories with a very minimalist interior architecture. American period style walnut beds with tufted headboard and plum-colored satin bedsheets were paired with a matching round area rug, and a soft indigo wall paint to contrast the warm undertones on the bedsheet and area rug. To set the ambiance of the bedroom, a small crystal chandelier was used. A simple yet endearing bedroom design which uses a soft Lavender paint color paired with light gray carpet flooring to create a light background. All wooden furniture are painted in white, helping create a contrast with the purple walls. The multi-hued batik bed sheets in purple helps add pattern and texture to the space, while the deep violet accent paint adds a hint of contrast while still maintaining the color scheme. 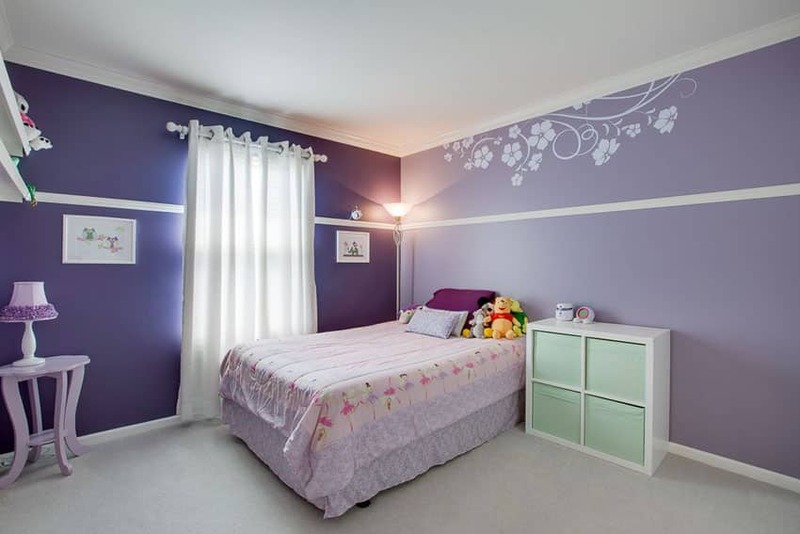 A very simple modern bedroom which features soft lilac-painted walls with a wall molding and floral decal stickers. The space is simply furnished with a bed and bedbox with pale lavender and pink bedsheets, white storage shelf and wall ledge, as well as a small petal-shaped side table painted in purple. Gorgeous solid maple wood furniture were generously used in the matching furniture pieces of this bedroom. The light natural color of maple goes well with the black cast iron accents, as well as the antique bronze pulls. Lavender-painted walls adds a more youthful vibe and helps make the room feel more “light” despite the use of heavy wooden furniture. The high ceiling of this bedroom was definitely maximized by installing a chandelier and hanging up picture frames above the window frame to make use of the free wall space. Aside from these, this bedroom also installs a bed canopy on its ceiling, further emphasizing the high ceiling. 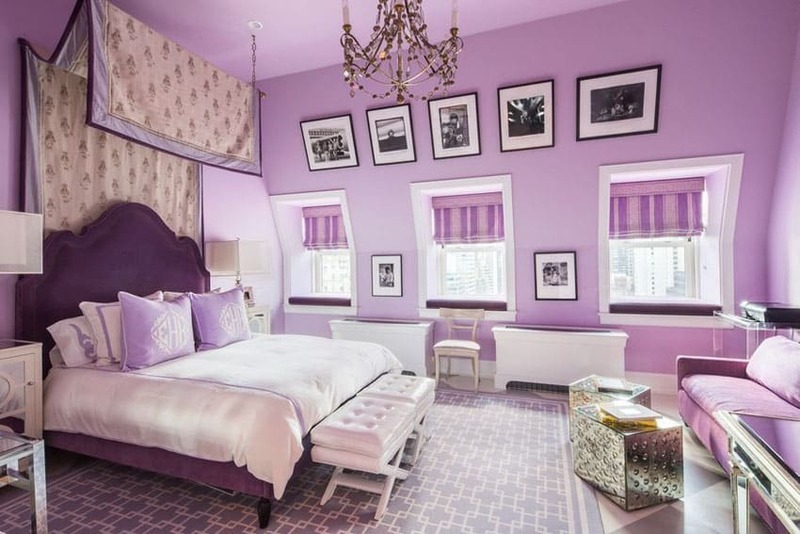 The bedroom features a gorgeous combination of purples. Vibrant lavender walls, plum velvet bed with lavender pillows, and a mauvy velvet-upholstered sofa on the side, and large lilac area rug with white geometric patterns. To help tone down the colors, white-painted furniture pieces were incorporated, as well as stainless steel and mirrored furniture. An elegant bedroom which combines contemporary elements with traditional-inspired details. It features a plum-painted accent wall, a large wall-mounted tufted headboard which brings your focus into the mulberry bed. On the side is a matching mulberry-colored area rug and a modern white sofa, white coffee table and a clear acrylic side table. For the lighting, it uses a modern laser-cut ply chandelier which was made to mimic the look of traditional style chandelier. The large window on the side was framed with heavy beige drapery to add a luxurious element into the space. A gorgeous classic Rococo revival style bedroom featuring a burgundy-based color scheme combined with silver and gold to add to the elegant appeal of the space. Wall paint is a deep burgundy color to set a serious mood, while the door windows and frames, as well as the flooring are in white to tone down the dark wall color. The bed is a four-poster silvered rococo style bed with conch motifs and heavy burgundy velvet drapes. It has matching pearlescent white night stands and gold table lamps to match with the faux columns painted in silver and gold. The spacious bedroom also has a generously-sized sitting area with a sofa and over-sized ottoman, with burgundy upholstery. The sitting area is framed with a pastel pink traditional style area rug which almost occupies the whole floor area of the sitting area. This is another gorgeous empire style bedroom featuring elegant period furniture pieces with gold accents to further emphasize the luxurious feel of the room. 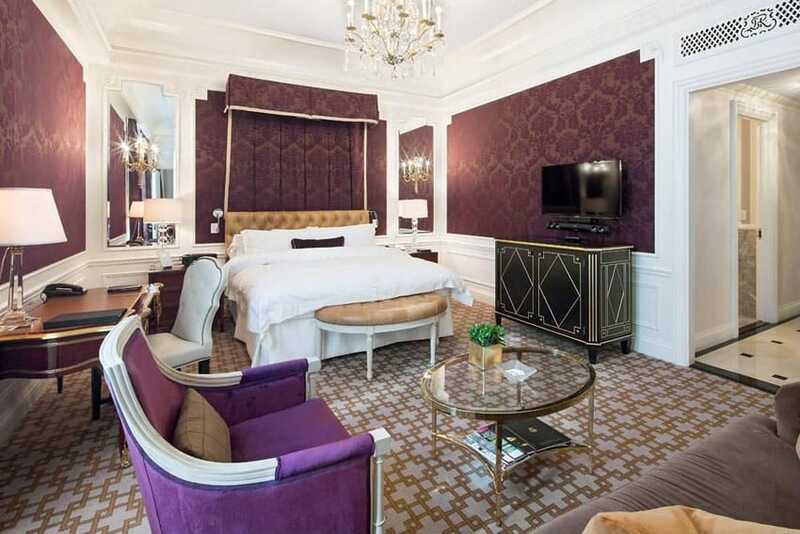 The floor uses square geometric patterned carpet tiles in white and gold, while the walls has white paneling and burgundy damask wallpapers to match the burgundy tapestry on the bed canopy. The bed has white sheets and a light brown leather-upholstered headboard to tone down the purples, while other furniture pieces are a combination of different wood species with gold inlays. The sitting area features a white-framed chair in purple velvet upholstery and a casual brown velvet sofa to go with the gold and glass coffee table. A simple modern bedroom with solid cherry wood flooring and purple-painted walls. It uses white modern furniture pieces to help tone down the purple wall, but adds a few accent purple pieces to help put together the look of the bedroom. This bedroom not only uses lavender paint on its walls, but it also uses the lavender pain on its sloped ceiling as well, making the walls seem higher. Furniture pieces used in the room are all in white – white leather-upholstered bed, white desk, shelves and computer chair, and white side tables. It also has a modern acrylic bubble chair on the bay window area and a grape-colored area rug underneath to help accentuate the area. 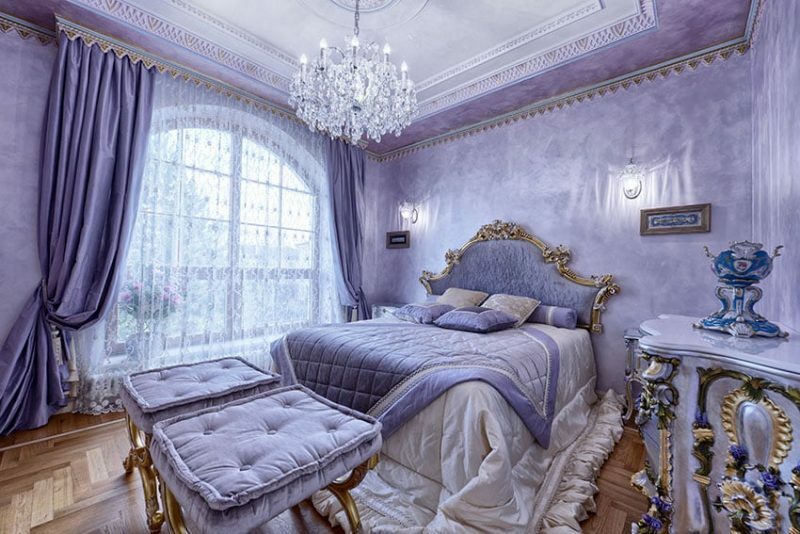 This small, dreamy bedroom features a soft lilac-based color scheme to match with the fairy-tale concept of the space. The bed has a gorgeous gold metal framing to mimic the shape of a carriage, as well as simple white-painted classic furniture pies on the sides. It also features a very feminine purple tulle bed skirt and a modern lavender area rug. To create more mature ambiance, this bedroom uses a mauve-based color scheme for its design, with burgundy accents for added contrast. Walls were painted in a neutral-toned purple color and has white floral decal stickers to add a bit of pattern on the surface. It’s Asian-inspired furniture pieces are in dark wengue, while the bed sheets and pillows used were in burgundy to contrast with the lighter-toned walls. This bedroom features an interesting combination of lilac and black paint on its walls, contrasting with the soft, all=-white furniture pieces used in the bedroom. This creates a unique look and a bold contrast between the finishes. The black-painted wall also helps make the white furniture pieces pop-out more, as well as accentuate the pale wood engineered flooring. American cherry wood flooring gives this space a very classic appeal, while the plain white walls and contemporary furniture pieces adds a more casual touch to the look of the space. The bedroom also features and dark plum and silver accent wallpaper, cherry wood furniture pieces combined with white laminated pieces, as well as a vibrant silver and purple quilt on the bed. This rococo style bedroom definitely screams luxury and elegance with its combination of fabrics and finishes. 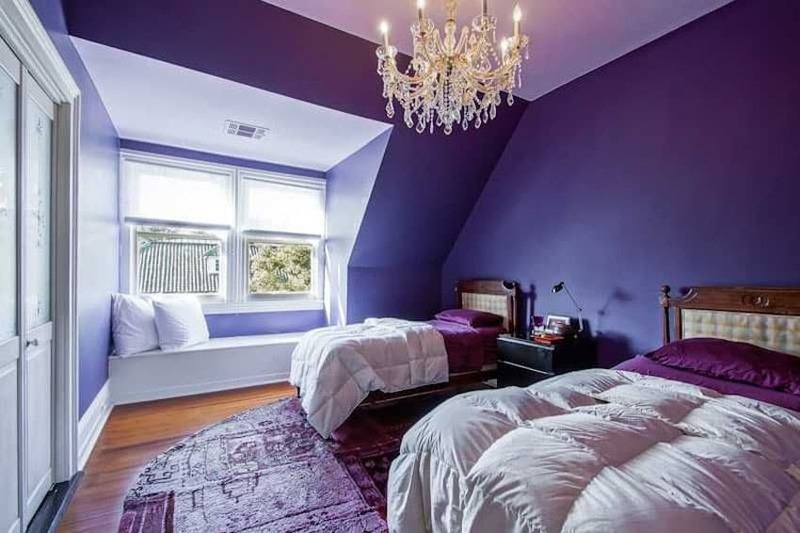 While it may have less purple than the previous bedroom examples, it features a small, but right amount of purple accents to complete the look. Paneled walls are white with gold accent inlays, in combination with textured wallpaper. You will also see typical rococo motifs on the walls, which are gilded as per typical in this period style. The bed is definitely the superstar in this design. It has a gilded framing and an upholstered headboard with elegant cream and white bedsheet and pillow covers, as well as a mauve tapestry canopy to further accentuate the area. At the bottom of the bed is a gilded lounge chair upholstered in white faux snakeskin pattern, and round purple accent pillows. While the other bedroom examples relies on paint and fabrics to achieve the purple tone in the room, this contemporary bedroom uses lighting instead, to achieve the look. 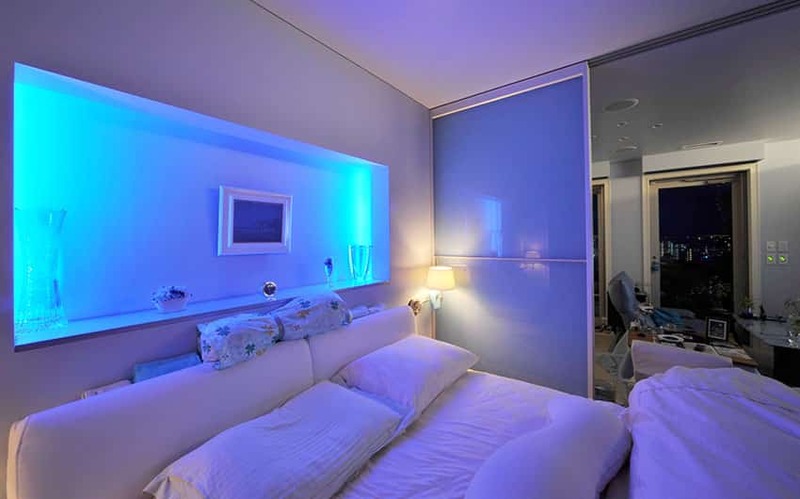 The small bedroom space are all in white, but it uses purple LED lights to give the room a purple tone as the white readily absorbs the purple light. A very simple yet elegant bedroom which uses simple white-painted furniture pieces combined with a neutral-toned mauve wall paint for a soft yet feminine vibe. It also has white sheer curtains to soften the look, and uses light cream carpet for the flooring. This small bedroom combines cream and purple to create this contemporary style bedroom design. 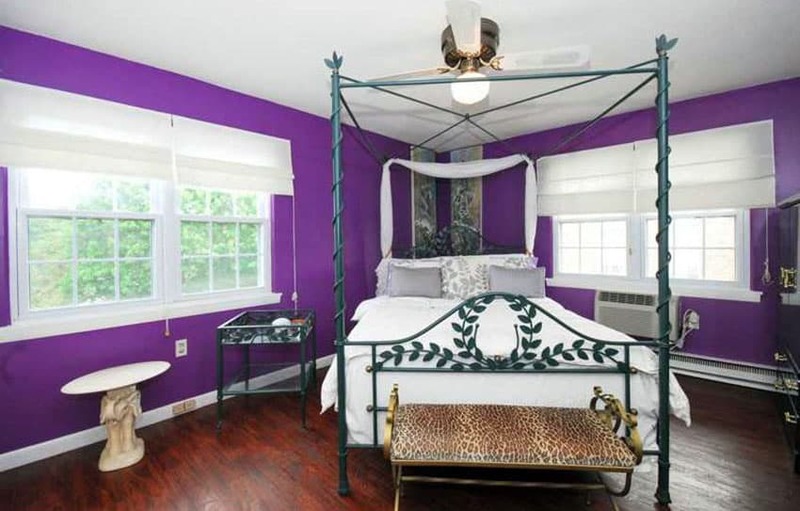 Lavender-painted walls were combined with cream carpet flooring for a light background, while the furniture pieces are laminated in a glossy cream color.The bed sheets are also in purple to match the color of the walls, and it also adds a darker grape-colored throw and white pillow to add more texture. Purple bedroom ideas that match the decor and bed lines can create a cohesive design style without costing a lot of money.